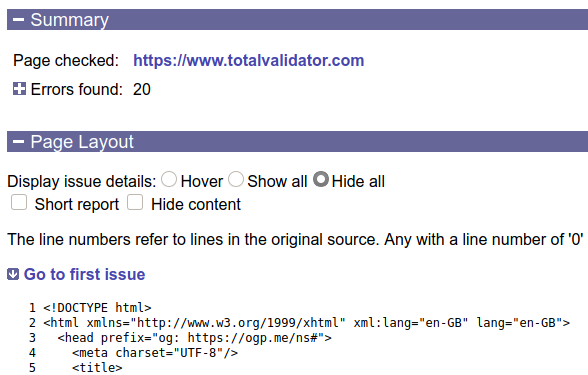 Total Validator reports its results as standard web pages that can be read by a standard browser. Three types of page are used; a Page report, an Issue report and a detailed results page. The page and issue reports provide a summary of the tests performed, together with a list of links to the detailed results pages for each page validated. 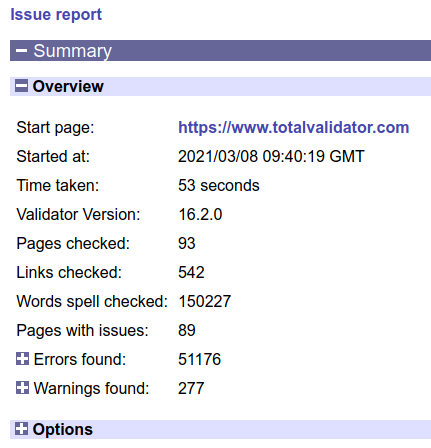 The Page report is stored in a file called 'TotalValidator.html' and the other pages are stored in a sub-folder called 'Results'. These are normally overwritten each time you run Total Validator so that you don't run out of disk space. The location of this 'Documents' folder is also displayed in the 'About' menu. You can change the name and location of these files using the save results to and unique report options on the Results tab of the Pro version. Each page URL displayed is a link to a detailed results page (follow the link for an explanation of the 'Display issue details' options). You can also sort the list of results by 'Links' (the original order in which the pages were validated), by 'Path' (an alphabetic list of URLs), or by the pages with the 'Most' or 'Least' number of issues. Normally the representation of the web page shows each of the tags within it on a separate line, with indentation showing how the tags are nested within each other. This should make it easy to read the results even with the most poorly formatted source web page or where the layout style varies across the site. It is particularly useful when the pages are generated by a computer program, as these tend to generate the most irregular web page source. Similarly, CSS style sheets and statements within <style> tags are reformatted and reorganised to allow errors to be easily reported on. To make it easier to read the report, the 'Hide content' checkbox toggles the display of text content and the 'Short report' checkbox hides everything except those lines with issues. You can set these in advance using the Hide content and Short report options. The line numbers on the left refer to lines in the original source so you can quickly get to and amend the faulty tag or CSS statements in the original web page source. Line numbers marked as '0' refer to tags added by Total Validator. 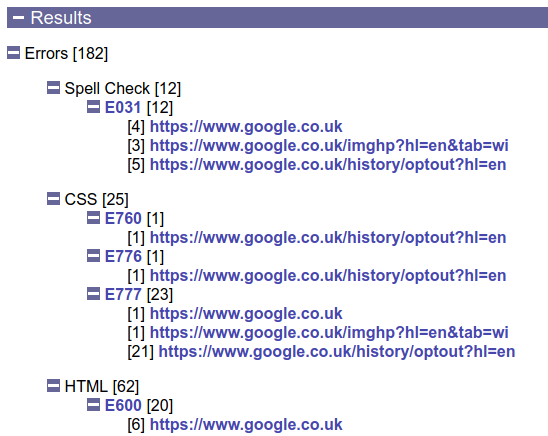 These are optional tags that are implicit in the standards, but are sometimes displayed in the results as somewhere to attach errors/warnings to relating to the subsequent page. The image below shows an example of how an error is displayed. These are highlighted and begin with an 'E' followed by a unique number for the error, then some explanatory text. Probable errors begin with a 'P' and Warnings begin with a 'W'. There are also up and down arrows next to the issue to allow you to quickly navigate to other issues on the page. Note that column numbers referring to the original source are not displayed. This is deliberate as many issues apply to the whole tag. Also we've found that having column numbers often detracts from understanding the issue. Instead where possible the item in question will be highlighted in red as shown above. You can then click the issue text instead of hovering over it to toggle the display of this extra information. The same option also appears on the Page report, where it applies to all of the Results pages. In the Pro version you can also set the default value across all of the Results pages if you prefer a specific option every time. Note that the line number given refers to the first line of the content containing the spelling mistake. So if the content spans multiple lines it may not match the line with the mistake on. But it should still be simple to find the mistake in the original page. With the Pro version, if the spelling validator highlights a word which isn't a mistake, you can click on it to add it to your own dictionary of words so it doesn't appear in future validations. With all modern browsers, clicking on a word will cause the highlighting of the word and the suggestions to disappear wherever they appear in any page validated, and the link will be disabled to prevent double-clicking by mistake. With old versions of IE (anything earlier than IE10), when you click on a word a new page will appear with a confirmation message and you will have to use the back button to continue to add further words or to continue to view the validations results. 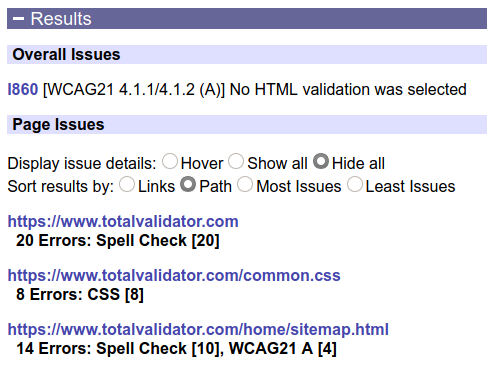 Note that ad-blocking and other blocking extensions can prevent spell check corrections from being sent to Total Validator. So you may need to disable these on results pages.